Tim Finin has been teaching courses in areas like Artificial Intelligence, Semantic Web, and Intelligent Information Systems since he came to UMBC over twenty years ago. A professor of Computer Science and Electrical Engineering, Finin was named this year’s UMBC Presidential Research Professor (2012-2015). Finin’s research is focused on applications of Artificial intelligence problems in information systems and has included contributions to natural language processing, expert systems, the theory and applications of multiagent systems, the semantic web, and mobile computing. He is a principal faculty member in UMBC’s Ebiquity Research Lab. 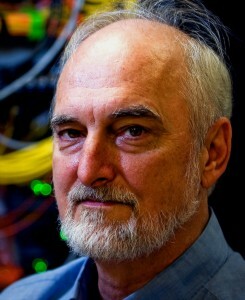 In 2009, the IEEE Computer Society awarded him a Technical Achievement for notable contributions to distributed intelligent systems. Finin has over 350 refereed publications under his belt and has received research grants from organizations like the National Science Foundation (NSF), Microsoft, the Office of Naval Research, and Google. In August 2012, Finin received a $400,000 grant from the NSF Secure and Trustworthy Cyberspace (SaTC) program for a project entitled Policy Compliant Integration of Linked Data, a collaboration with M.I.T. and the University of Texas at Dallas that investigates how to better manage security and privacy constraints while querying semantically annotated linked data sources. Finin holds a Ph.D. in Computer Science from the University of Illinois. In August 2012, Computer Science and Electrical Engineering professors Tim Finin and Anupam Joshi received a $400,000 research award from the NSF Secure and Trustworthy Cyberspace (SaTC) program for a three year project to investigate how to better manage security and privacy constraints while querying semantically annotated linked data sources. The project, Policy Compliant Integration of Linked Data, is a collaboration with researchers at M.I.T. and the University of Texas at Dallas.